Two officers were injured and a police car set on fire after thousands of leftist demonstrators gathered to protest a congress of Germany’s right-wing Alternative for Germany (AfD) party in Cologne. Several arrests have been reported. Scuffles between protesters and officers began after singing and chanting demonstrators tried to block some 600 AfD delegates from entering the congress venue. Footage posted by Ruptly showed riot police storming protesters who were holding a banner reading “No Borders,” with one man being escorted away by two officers. Separate footage from German broadcaster N-TV showed a group of around 50 people clashing with police on horseback, while another video showed a smoke flare being deployed. A male protester was arrested after injuring the face of an officer who had been escorting AfD party members, according to AFP. Several other demonstrators have also been arrested, according to German tabloid Bild. 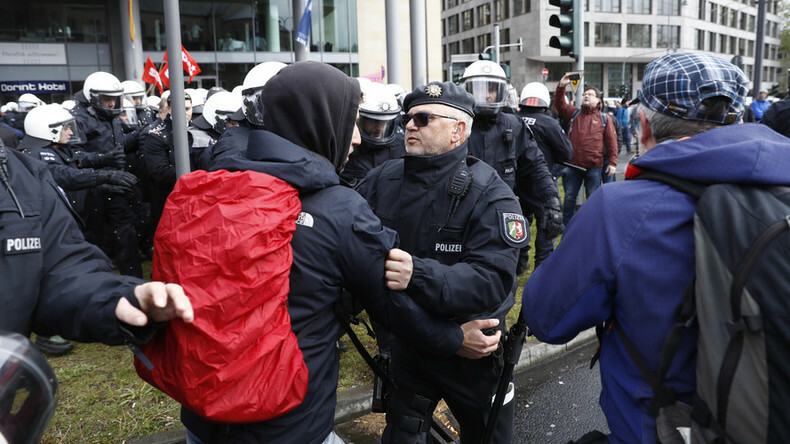 Around 100 protesters were also stopped by police for identity checks, but not detained, a Cologne police spokesman told Reuters, adding that the situation is “very dynamic” and “fairly aggressive” in some areas. A TV correspondent cited by Reuters said that police have used pepper spray against some demonstrators. Police deployed some 4,000 officers in the area ahead of the planned protest, with authorities expecting some 50,000 demonstrators to mobilize during the two-day gathering of AfD party leaders. Authorities also imposed a four-day no-fly zone over Cologne in preparation for the event. The congress includes some 600 AfD delegates, who have gathered to discuss policy ahead of September’s national elections. The populist right-wing party, which is represented in 11 of Germany’s 16 states, is known for anti-Islam rhetoric, as well as its opposition to Chancellor Merkel’s decision to welcome over a million migrants to Germany over the past two years. Over the weekend, AfD is hoping to sign off on a campaign strategy that it hopes will pave the way for it to enter the country’s national parliament for the first time in the party’s four-year history. AfD’s support has dwindled as the number of asylum seekers coming to Germany has decreased, with recent polls showing it with between seven and 11 percent support – a steep drop from the 15 percent it enjoyed late last year. All of Germany’s mainstream parties have ruled out working with AfD in a coalition, should the party be successful in winning parliamentary seats in the September 24 election. Merkel’s Christian Democrats are currently leading in the polls. The chancellor is running for a fourth term after nearly 12 years in power.